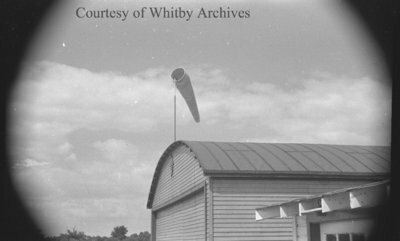 A black and white negative of the roof of Norman Irwin's airplane hangar at left and the roof of the Whitby Yacht Club clubhouse at right. Hangar and Whitby Yacht Club Clubhouse, c.1938, Marjorie Ruddy. Whitby Archives A2013_040_735B.